YASDA YBM 7Ti Offers Industry’s Highest Machining Accuracy, Performance in Extremely Challenging Materials. The rotary table on the YBM 7Ti offers four times the rigidity compared to other rotary tables. With a unique table design, there is ample room around the pallet which provides smooth table movements and allows operators to get a closer and clearer view of their parts. The YASDA YBM 7Ti features a 25-ton, H-shaped steel machine base for absorbing cutting forces and drastically minimizing any machine vibration. All axes have hand-scraped, hardened box guideways for high accuracy when making challenging cuts. Hardened, ground and lapped guideways enable rapid feeds of up to 48 m/min, yielding the highest accuracy throughout every full stroke. To achieve maximum performance levels, the mating faces of the guideways are approximately double the width of more traditional guideways. The YASDA YBM 7Ti features a direct-drive spindle system that is designed to keep cutting forces away from the spindle motor, which maintains consistency and repeatability. A YASDA self-adjusting spindle system automatically adjusts the preload to the spindle bearings, enabling a wider range of cutting capabilities. 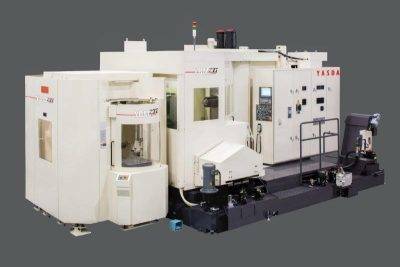 YASDA horizontal machining centers have a large work envelope with X,Y, Z travels of 49.2″ x 39.4″ x 43.3″ (1,250 mm x 1,000 mm x 1,100 mm) respectively, a vertical rotation of 360⁰ and a horizontal rotation of +/- 110⁰. A two-pallet system has 19.7″ x 19.7″ (500 mm x 500 mm) pallets for a maximum loading capacity of 1,102 lbs (500 kg) on each pallet. Maximum part size is 24.8″ (630 mm) in diameter and 19.7″ (500 mm) in height. A YASDA curvic coupling system with large diameter circle gears is used to support the back side of the pallet, allowing the accuracy of the center of the pallet to be fully maintained. An Automatic Tool Changer holds up to 450 tools. The powerful, new easy-to-use FANUC FS31i-B5 control is furnished standard. YASDA, the elite Japanese builder of machining centers and jig borers has earned a reputation of preeminence in accuracy, precision and quality. In order to ensure the utmost in quality and precision, YASDA Precision uses primarily YASDA machines to build their own machine tools. With meticulously hand-scraped surfaces and superior machine design and construction, YASDA’s extremely high precision stands alone.